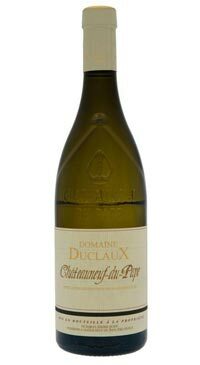 The Duclaux Family is one of the oldest in Châteauneuf du Pape. This family built up its domain through the centuries and was one of the first founder members of the appellation association in 1904. The Quiot and Duclaux families built up bounds and family connections over the years. The last representative of this family, Emmeline Latour, died on 23rd April 2001. Godmother of Florence and Jean-Baptiste Quiot, she bequeathed them this wonderful domaine. A blend of Clairette, one of Southern France’s oldest grape varieties, and Grenache Blanc. These white grapes are known for producing weighty wines that are pleasantly rich and viscous. The Duclaux vines grow on soils mainly made up of river sand androlled pebbles. Terroirs containing alluvial soils, sand and stones in the lower vineyards and clay-limestone soil on the slopes. The entire harvest is pressed and undergoes static settling at 12°C. Fermented on the fine lees in Burgundy barrels, with stirring, for 8 to 10 months. The result is a pale yellow and brilliant white wine with a concentrated tropical fruit bouquet and hints of oak. Great aromatic fullness and liveliness on the palate, well balanced with an excellent persistence.